I have a couple more little projects that I worked on this weekend in preparation for Christmas decorating. First, I bought this very gold cherub figurine at a consignment shop for $5. He stands about 20" tall. I toned him down a bit with Rustoleum Heirloom White paint, but not the spray paint. I used an almost dry brush and sort of dabbed the paint on lightly. I like him much better. I had a bag of Dollar Tree foam balls I purchased recently to make some sort of Christmas ornament. I squeezed them a little so they weren't so perfectly round. Then I stuck them on skewers and stood them up in some florist foam. (Also from the dollar store). Then I painted the snowballs with Heirloom white. When they were dry, I poured some mica snow on a paper plate, and diluted some Mod Podge in a baggy with water. Then I stuck the foam balls on a stick in the glue baggy mixture and then rolled them in the mica snow on the paper plate. If a spot seemed to bare, I sprinkled a little more snow on with my fingers. Here are my ten crafty snowballs. For photo purposes I have posed my little snowballs with a vintage Tonka dump truck and a vintage look snowman figurine. now that is super cute! I wish I had tried your method when I made snowballs last year! I used thin quilt batting topped with glitter, and it was a royal mess! Love your truck. I've got a cousin to yours with a green truck bed. Your angel is absolutely angelic!! And those snowballs rock! your angel is just beautiful and the snowballs are perfect with the snowman! Love them both. Love the new look on the angel. Those snowballs I may just have to copy. oh my gosh that truck filled wit snow balls is so cute!! You are so crafty and clever!! Both projects turned out beautifully. The snow balls are perfect and the cherub looks like a million bucks! I like it much better white. You are having entirely too much fun without me! I wish I was there dabbling in mica and tonka trucks with you. Sigh. Keep up the good work. The folded page books are completely intriguing too. Love the look! I love both of your idea's...but especially love the snowballs! They look so cute in that little truck. I've got to start thinking about Christmas and think I'll try making some snowballs for myself. Thank you for sharing how you did it Carlene. Those snowballs are so stinkin' cute! I love the vignette you put together with them. Adorable! That sweet little cherub is so pretty! Just this morning I was searching etsy & ebay for an angel. I would have scooped him up in a heartbeat for $5! Another great couple of projects Carlene. You really have been busy. Love the snowballs in the truck. so cute by Mr. snowman. You have found some fun pieces to give your magical white touch. Love the snowballs in that truck! So cute! Love, love the snowballs!!! How creative!!! The little cherub is so pretty! Great inspiration! Love the snowballs and cherub is better. Great projects. You are one crafty lady! Those snowballs are perfect; that mica snow is megamazing!Kudos to you for inspiring me to get with the program already and start some serious Christmas creations! Your snowball truck is adorable. I saw those balls at the store the other day and had no clue what to do with them. Great idea. Carlene... I LOVE the new look of your cherub! You got it perfect!!!! I look forward to see what you do with the little angel! 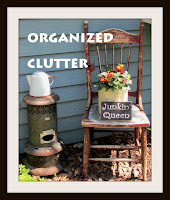 Please join us for TUTORIALS TIPS AND TIDBITS, my weekly linky party. Your project would be perfect to share! Linky goes live tonight (Wednesday) at 8:00 pm. Hope to see you there! Cute...cute...cute! What a wonderful transformation your angel has undergone. Beautiful! Thanks for sharing your snowball project, too. they look darling in the back of your little pick up truck. OK Carlene...I am totally envious of that cherub!! $5??? Total score! I really love the white better too! The snowballs are genius and I'm going to be looking for those little foam balls at my Dollar Store. They look so darn cute in that vintage truck (which I know want to look for also!) and the snowman is darling! Nice vignette! You make me wish I had a gold cherub! It is fabulous now! The snowballs in the dump truck is such a cute idea!! I wish I was organized enough to "pre-deck" I am always doing everything at once...sigh, maybe next year! Now aren't you clever! That angel looks wonderful! Carlene, I love your snowballs!! They are wonderful. What fun you'll have with those in decorating for Christmas. okay...I want to make those for sure!!!! Love them in the dump truck next to Frosty! Easy, easy... I have the styrofoam balls from a giveaway I won and I have the snow glitter at school... Now I've gotta make some!